The Oosterenk Stadion was until 2007 the home of PEC Zwolle (between 1990 and 2012 named FC Zwolle). A first sports complex was built at the site of the Oosterenk Stadion in 1934, however no professional football was played until PEC Zwolle made it its home in 1970. The arrival of PEC Zwolle made it necessary to build three new stands and to install floodlights. The new stands mainly consisted of standing places and complemented the main seater-stand. In December 1985 a fire engulfed the main stand. A new stand was built in the following year and opened in 1987. The stand was named after Johan Cruijff, making it the only stand in the Netherlands ever having been named after the Dutch legend. Until the mid 1990s the majority of the stadium still consisted of standing places. This changed in 1997 when these were converted into seats, reducing the capacity of the stadium to about 6,800 seats. From the early 2000s FC Zwolle started planning for a new stadium as the Oosterenk Stadion did not have the required facilities to provide sufficient income. After a long process plans for a new stadium at the site of the Oosterenk got approved, which meant that the old stadium had to get demolished. 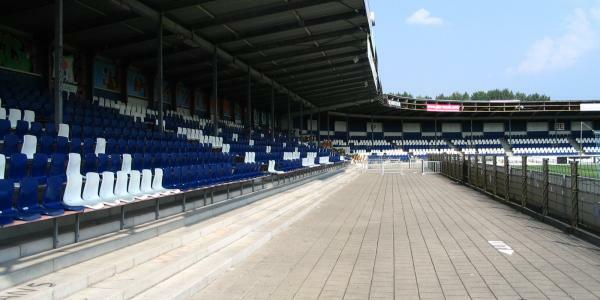 The club opted for the gradual demolition and construction of the new stadium so that Zwolle could keep playing its home matches at the stadium. The last match at the complete Oosterenk Stadion was played in April 2007. The league match between FC Zwolle and De Graafschap ended in a 2-2 draw. Construction of the new IJsseldelta Stadion was completed in 2009.